In 2018 the European Union introduced a set of laws called GDPR that penalize any company that does not collect very specific permissions from its website users, using very particular language. Compliance with these rules was challenging for a variety of reasons, so we made the decision (along with some other news outlets such as the Chicago Tribune and Los Angeles Times) to block users who fall under this law from accessing our site until we were able to offer a solution. By adding the permission message at the bottom of the screen, we can now allow access to readers in the EU again. (Welcome back! We missed you!) 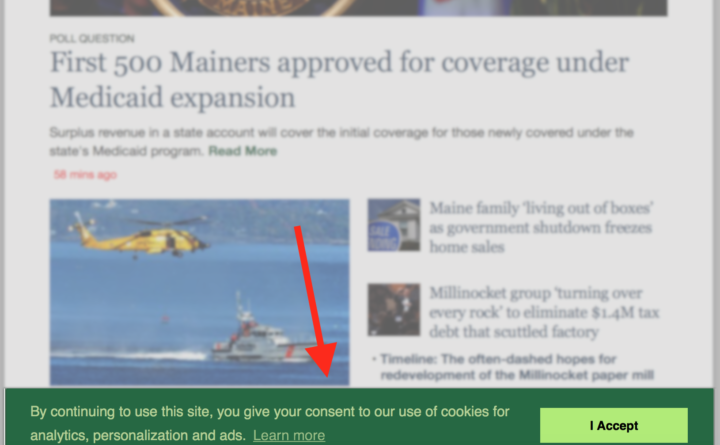 After clicking “accept,” you should not be prompted to grant permission again for a year, unless your browser is set to not allow certain types of cookies. To understand how we are doing — Cookies help us understand how many people visit our site, what they are reading and how they use our digital products. We use this data to help us understand what our readers are interested in and to plan for the future. To provide a better experience for subscribers — If you are a subscriber, when you log in we show you fewer ads and surveys than we show nonsubscribers. To make the ads you see more relevant to you — Cookies allow us to show you ads personalized to your interests. This is why if you look at products on some websites, ads for those products will then appear elsewhere on the internet, including on our site.